In his twenties he battled tuberculosis for eight years, then went on to run his own clothing business before marrying in his late thirties. And the 101-year-old Torao Toshitsune has eaten raw fish pretty much every day throughout his life. 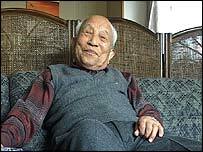 Mr Toshitsune is one of Japan's 23,000 centenarians - a club that is growing by 13% annually, and where the oldest member is 114. At his neat Osaka detached house, where he lives with one of his sexagenarian daughters, Mr Toshitsune keeps a regular routine of copying out Buddhist sutras and preparing the traditional Japanese tea ceremony. Between tasks, this remarkably active senior citizen reveals what his next goal is: "Well, what's most important for me is to be Japan's number one." Mr Toshitsune wants to outlive everyone. And when it comes to longevity, Japan, as a country, appears to be doing just that. Women can expect to live until 85, men until 78, four years longer than Americans and Europeans. On the outskirts of Kyoto, 83-year-old Yuji Shimizu contemplates this phenomenon during a round of golf with his younger friends, who are in their seventies. "I think this is because the food industry and the environment have improved," he remarks. "On average, we can live longer." Whether it's the diet, or the traditional family structure where roles were clearly defined, or just something in the genes, Japan's elderly are remarkable. But while life may be a game of golf for Mr Shimizu, his grandchildren have huge problems ahead. Japan is the world's least fertile nation with childbirth rates of just two thirds of that in the US. By 2007, Japan's population is expected to peak at 127 million, then shrink to under 100 million by the middle of the century. This means 30 million fewer workers at a time when the number of elderly will have almost doubled. "In the year 2050, if the birth rate remains the same people over 60 will make up over 30% of the population," explains Shigeo Morioka of the International Longevity Centre in Tokyo. So how will Japan's finances stay on track? After a decade of economic stagnation and huge deficit spending, the public sector debt is already about 140% of the country's gross domestic product (GDP), the highest rate among industrialised countries. The International Monetary Fund predicts that as the falling birth rate takes grip from 2010, the cost of running Japan's welfare state will double to more than 5% of GDP, while current account balances will deteriorate by over 2%. But unfortunately, Japan appears poorly prepared both financially and politically. Glen Wood, Vice President of Deutsche Securities Japan, asks; "Who's going to fund the pension fund for the next generation and indeed who are going to be the new Japanese worker? "Who is going to build the economy, who are going to be the leaders? Who are going to be the producers of the GDP going forward?" One option is further welfare reform. Another is immigration, possibly from the Philippines and Indonesia. But so far, any emerging policy appears restricted to a limited number of nursing staff. 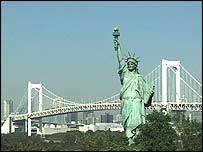 Standing next to Tokyo harbour is a version of New York's Statue of Liberty. But, as yet, Japan is not ready for an Ellis Island. "Japan has never really liked that option in its history and I think it's an option that's becoming more and more plausible and necessary," insists Mr Wood. In Japan, as in Europe which also faces a workforce decline, immigration is a very sensitive subject. But for the Japanese economy, facing 8% fewer consumers by 2050 means slumping domestic sales of cars, hi-tech kit and home appliances, perhaps even another property crash. Of course the Japanese could always have more children. The government is currently considering financial rewards for procreative couples similar to those in operation in Australia. But there would be no pay back until 2030, when today's babies are taxpayers, and the demographic crisis, like in Europe, starts to unfold in 2010. In contrast to Japan - and of course the European Union - the US population is expected to increase by 46% to 420 million by the middle of the century. Although President Bush must re-devise Social Security to take account of a 130% rise in America's over 65s, the IMF foresees a positive contribution to the US current account balance from the combined forces of fertility and immigration. Some voices in Japanese industry are calling for radical changes to the nature of the Japanese labour market. They want a shift towards financial services, though doubts persist over the country's ability, let alone willingness, to move away from manufacturing. "Japan still has problems getting a viable banking system, let alone shifting their auto business or their semi-conductor business or the broad based tech manufacturing business overseas," says Mr Wood. Japan can either drive some radical reforms or else run the risk of a vicious ageing recession. Falling demand and a lower tax take could result in soaring budget pressures and a basket case currency. Come 2020, Japan could be more dependent on a shrinking workforce than any other industrialised power. There are fears that the world's number two economy is doomed to a permanent recession. But none of this is Mr Toshitsune's concern anymore. At 101, he chuckles that, he feels fine.